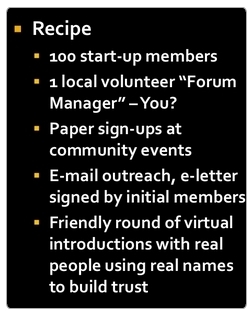 Here is a simple guide to successfully launching an online community forum. A "Neighbors Forum" is the most local version of our online civic engagement model. It combines inclusive "community life" exchange with civic engagement on very local public issues. Forums do not launch themselves. "Build it they will come" simply doesn't work. We've found it takes 100 members to successfully launch an active forum. Our shared technology platform is the easy part. We set it up for you once you've recruited 25 supporters to help you recruit. This is a pilot space that officially "opens" when you've reached 100 members. If you volunteer to lead a forum, it is free to host a forum with us and gain access to our useful peer-to-peer support network. We do hope your participants will donate and we are experimenting with forum sponsorship. We do accept funding to help a community get going. A community foundation or major donor is welcome to step in to speed up outreach. Submit a simple spreadsheet (Google Doc sample) with the names and email addresses of your first 25 members to signups@e-democracy.org, and we will technically set up your forum and provide you access. In the body of the email, provide a CLEAR indication of who your Forum Manager will be and their contact information. We will get back to you and/or your Forum Manager with the home page and login instructions, as well as access to resources to help you manage the forum. In-person outreach works best. From our print materials, adapt our paper sign-up sheets and email invites, and use them to door knock in your neighborhood or clipboard or table at local community events, farmers markets, etc. THIS WORKS. Adapt and hang our promotional posters where you can and feel free to make your own flyers. Circulate your invitations via email, Facebook, etc. inviting others to join. This works better as you open and demonstrate critical mass. This is also a good time to be recruiting volunteers! If you haven't yet technically set up your forum, you're ready to go! Continued outreach - The technology is the easy part. Outreach is what really makes or breaks opening a new forum. We created a group for people waiting for a forum to come to their area. Visit the New Forum group to see who might be willing to join you in a local outreach effort, and email contact@e-democracy.org to join.